Children’s fancy dress is a great way of exploring your creative sewing and crafting skills. But coming up with some original designs and something that the kids will enjoy wearing can often be a challenge. Well, we’ve got 11 simple fancy dress makes that we’ll sure the little ones in your life will love and will inspire you too, ready for any seasonal holiday when fancy dress is a must! 1. Create bright animals masks using a simple paper plate, some raffia, paint and glue. Get the kids involved too by glueing and sticking on some extra bits like feathers, tissue paper and pom-poms! 2. Try a foam mask kit, available from most craft shops, or make your own felt eye masks. 3. Make a witch or princess hat from card. For the base, use a purple piece of card, curve it round into a cone and secure with tape. For the witch’s hat, glue on strips of black card to create stripes and cut out a doughnut shape for the rim. For the princess hat, add a piece of net fabric to the point of the hat to trail down in a veil-like fashion. 4. Fashion a floral crown. Using a glue gun and the same purple card, simply cut out petal shapes, curl them around a pencil to add a 3D dimension and then begin overlapping and glueing them together. 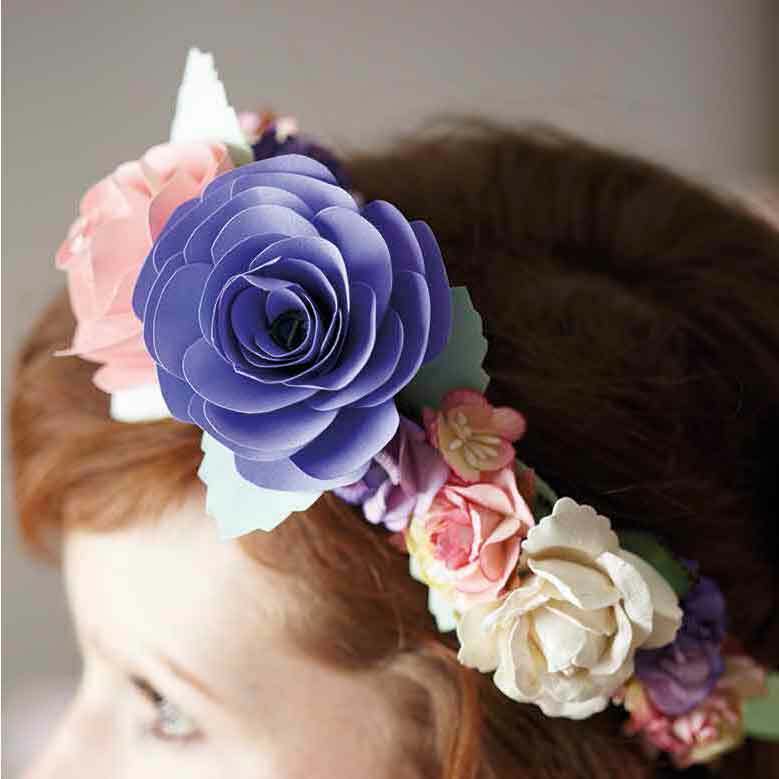 Once you’ve made a couple, attach them to a piece of jewellery or florist wire to create your floral crown. 5. How about a Native American headdress? Using a die-cutter and some feather dies, cut several pieces of brown and beige card into feathers. Cut a matching strip of card to fit around the child’s head and glue the card feathers in place. Add some real feathers, plaited string and beads for a real show-stopping outfit! 6. 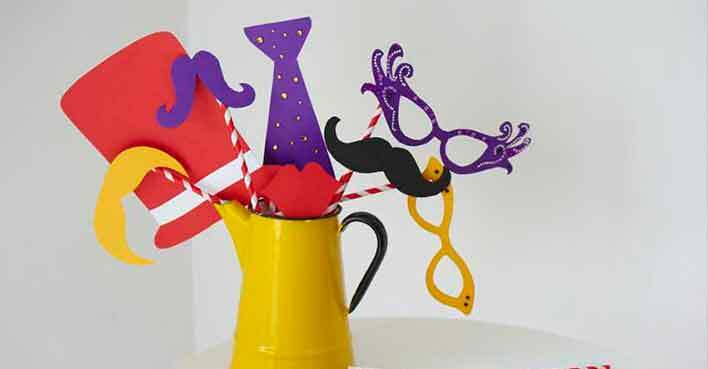 Create masquerade mask party props from card and colourful paper straws. 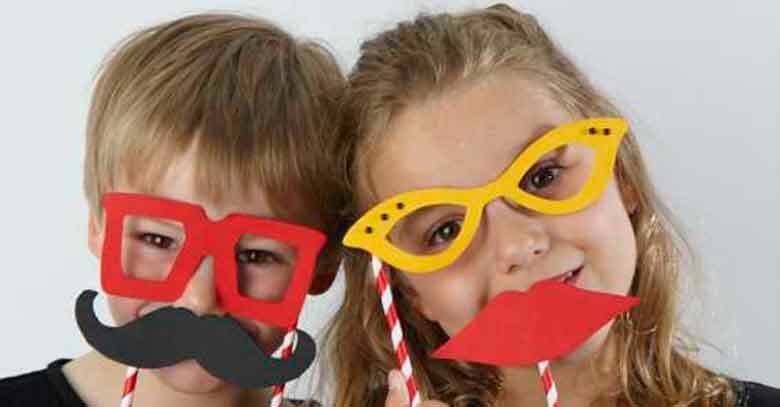 Simply cut out glasses, moustaches, lips and hairdos from thick card, tape them to the straws and hold up to your face for a quick fix at any fancy dress party. 7. Make fluffy-eared headbands for your little rascals! Animal fancy dress is always popular, so try using these fur pom-poms sewn onto a brown hairband for a little bear costume. 8. An animal tail is just the thing to go with cheeky ears. 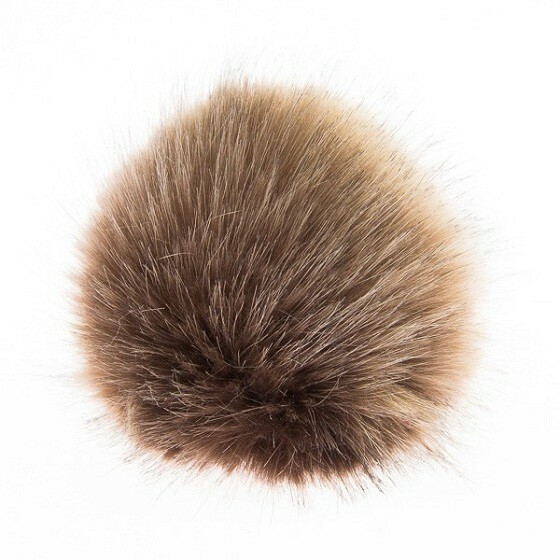 Use the same pom-pom for a bobtail, or for something a little longer, try this. Fold a strip of fabric in half lengthways right sides together, and sew along one short edge and the long edge. Turn right side out and stuff with toy stuffing. Sew the open end closed and attach to a piece of elastic wide enough to go around your child’s waist. 9. Paper plates make wonderful wings! For an angelic dress-up idea, cut white paper plates into small droplet shapes and stick them together, overlapping into a wing shape. Create two holes in the centre and thread a piece of white elastic through them and tie to create a loop. 10. Watch the birdie! For something a little brighter, try cutting different coloured fabrics in rows of scallops. Sew together along the edges and attach to a bright red T-shirt to create parrot wings! 11. A simple tutu-style skirt can be embellished with any fancy dress props. Simply attach gathered strips of net to a strip of fabric for a waistband. Use black net with sewn-on bright read spots to steal Minnie Mouse’s style or add spiders and spiderwebs for a ghoulish look in time for Halloween!